My third New Years Eve party of 2014! Emilie gave me a call, saying that there was a Chinese New Years party going on. I thought to myself – this is ridiculous, now many New Years parties am I going to go to this year? Then I replied to myself – Not nearly enough, because NYE parties are awesome. So we packed up and headed over. The party started out with a bit of a faux-pas, thanks to a bit of confusion about whether it was a potluck, or a “catered” party… I’d thought we were supposed to bring food for a night of Ramen (the fancy kind), so I had picked up rice noodles, broccoli, and boiled eggs ahead of time. Once I walked in though, I quickly realized that the host was going full-ham on this (literally and figuratively) and had barricaded himself into a corner of the kitchen while preparing the nights feast. 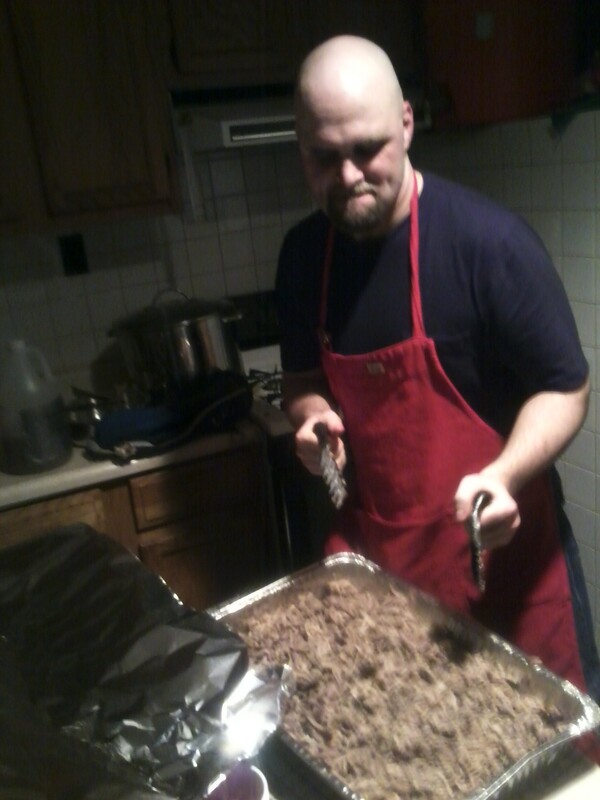 He had thick-cut rashers of bacon, pulled pork, bean-cakes… This man went all out, and cooked like a pro. The party itself was pretty straightforward; one of those situations where I walk in not expecting to know anyone, and then realize within a few minutes that I’ve met a good half of the people hanging around. It was great catching up with everyone, though for some reason I wasn’t really feeling the vibe of the party that night. I’d spent the earlier part of the day at the Dark Horse climbing competition with Chirag, Daniel, and Erin, and so I was a bit burnt out already… so I kept a bit to myself, and ended up talking with Mike on the phone for nearly an hour and a half, just walking around the block and catching up with how his life in California was going. It really reminded me just how much I miss hanging out with the old group of Mike, Daniel, and Dave… we just have a kind of rapport that I haven’t found in anyone else. Meh, maybe I’m just feeling melancholy. So we chatted, we said our goodbyes, and I rejoined the party for a bit – got to eat some of the pulled pork, and then headed back into the fray to keep chatting with people… for a bit at least, before I gave up the ghost and called it a night.